Ian Hislop and Nick Newman’s satirical play The Wipers Times will pitch up in Glasgow for 5 nights at the Theatre Royal in November 2017. 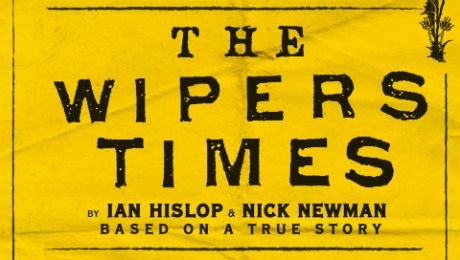 This true and extraordinary story of The Wipers Times comes to Glasgow for the first time. Get your tickets one of the five nights at the Theatre Royal. It tells story of the satirical newspaper created during the First World War in the Belgian town of Ypres (mis-pronounced Wipers by British soldiers). In the mud and mayhem of the Somme, 2 officers discover a printing press and create a newspaper for the troops. It’s not the sombre and depressing journal of life in the trenches that you might expect they would produce, it’s resolutely cheerful, subversive and very funny newspaper designed to lift the spirits of the men on the front line. Tickets are on sale now, book early for the best seats and celebrate the resilience of the human spirit in the face of overwhelming adversity. Defying enemy bombardment, gas attacks and the disapproval of many of the top Brass, The Wipers Times rolled off the press for two years.